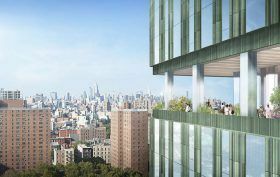 Additional details and a new rendering have been unveiled this week for a 62-story Lower East Side skyscraper designed by Perkins Eastman Architects, nearly two years after 6sqft first wrote about the project. 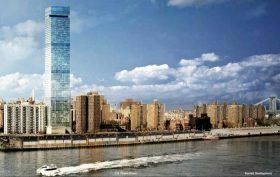 Located at 259 Clinton Street, the tower is a part of a controversial three-building project coming to the waterfront of the Two Bridges neighborhood. 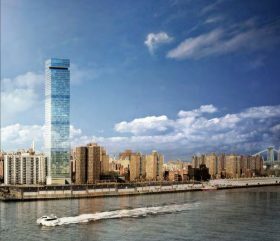 According to YIMBY, latest plans for 259 Clinton Street, developed by Starret Development, call for a 730-foot tower, slightly higher than an earlier 724-foot proposal. 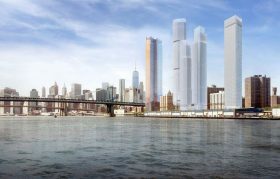 In addition to great diversity, personality, and transportation, the city is undertaking huge improvements on the east river waterfront, and developers are erecting new developments at all corners of the ‘hood. 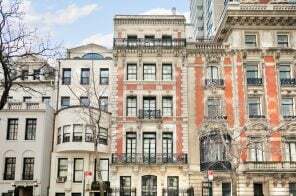 Ahead, 6sqft takes a look at everything that’s keeping the Lower East Side a vestige of old New York during its contemporary resurgence, from massive projects like Essex Crossing to a booming art gallery scene. Last 6sqft checked on the rental building at 247 Cherry Street in the Two Bridges area of the Lower East Side, it was revealed that the tower would rise to 1,000 feet, not surprising considering it comes from the supertall power team of JDS Development and SHoP Architects. 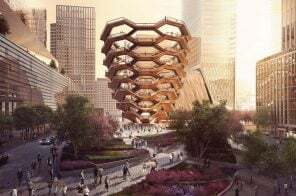 And now, after a Community Board 3 meeting earlier this week where JDS and SHoP addressed the controversial project, CityRealty.com brings a new set of renderings that show close-ups of the 77-story building’s green terra cotta facade and sky decks. 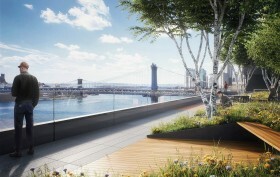 The hotly contested Two Bridges neighborhood–the area along the East River, near the footings of the Manhattan and Brooklyn Bridges where the Lower East Side meets Chinatown–has been making headlines nearly every week, whether it be for a new supertall tower or local residents’ opposition to what they feel is out-of-scale development for the mostly low-rise and low-income neighborhood. 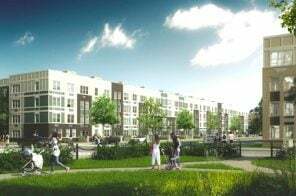 Just yesterday, The Lo-Down obtained information through a Freedom of Information Law (FOIL) request that reveals preliminary plans for two more residential projects that together “would add more than 2,100 residential units and 1.7 million square feet” to the area. A building at 271-283 South Street may rise 60 stories, while another at 260 South Street could reach 66 stories. 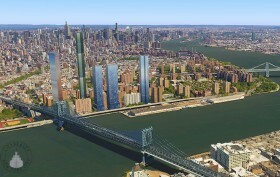 To put into perspective just how much this planned and under-construction new development will alter the LES skyline, CityRealty.com has put together this Google Earth rendering of all the proposed towers. 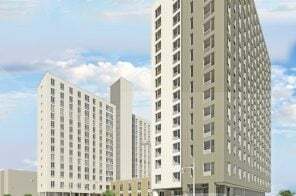 Back in April, the power team of JDS Development and SHoP Architects unveiled plans for a 900-foot, 77-story rental building at 247 Cherry Street in the Two Bridges area of the Lower East Side. 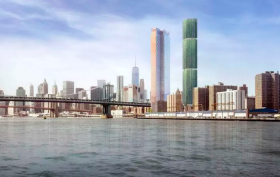 This neighborhood has become controversial for a recent influx of sky-high development; 247 Cherry will rise directly next to Extell’s 850-foot One Manhattan Square and not far from two 50-story towers at 265-275 Cherry Street. Its 900-foot height would’ve made it the tallest tower between Midtown and Downtown, but left it 100 feet shy of the supertall status JDS and SHoP are known for (the duo is responsible for the 1,438-foot-tall 111 West 57th Street and 9 DeKalb Avenue, Brooklyn’s first 1,000+ foot tower). However, Bowery Boogie reports today that the height may actually be at or above 1,000 feet, rising 80 stories.